The temple of Lord Tungnath in Uttarakhand - at an elevation of about 3200m above sea level - is supposed to be the highest Shiva temple in the world. The temple is accessed after a hike of about 3km from the road-head at Chopta. The temple is one among the revered Panch-Kedar shrines and sees a steady flow of devotees. The summit of Chandrashila lies about 1km ahead and above the temple of Tungnath. At an elevation of 4000m, Chandrashila acts like an elevated platform of sorts with a majestic - almost 360 degree - view of the Himalayan peaks. A quick tip - always backup your photos as soon as possible. I lost mine - quite a few lovely ones from the trek included - when my phone went dead all of a sudden. Only two - the ones uploaded on Instagram - survived. The loss of pics means that the post will have to be described in detail without any visual cues, i.e. a wall of text. I hope you all bear with me on this one. The trek to Tungnath and Chandrashila begins at the road-head known as Chopta. Chopta as a place sort-of owes its existence to the trek route. It is nothing more than a collection of a few dhabas, stalls and makeshift stables that cater to the devotees who trek up to Tungnath. Some of the stalls sell trek sticks - grab one for the trail is a little steep in places. The trail to Tungnath is cemented up to the temple. The trail begins its steady climb right at the outset and continues all the way to the top. At its start, the trail is lined with rhododendron trees - their distinct stems curving upwards almost from the ground up. The trees were in their last stages of bloom during my visit and the trail had a lovely tint of purple along with the green of forest, the blue-gray of the sky and the white of the Himalayan peaks. The peaks of the Garhwal range are a companion for the initial half of the trek; due north-north-west or towards a trekkers general left. The Gangotri peaks, the Kedar peaks and the Chaukhamba massif are all visible. The trail continues through a lovely forest, which despite the 'efforts' of the people coming here, is quite clean. Just before 1km in to the trek, the route starts climbing rather steeply through a series of switchbacks (u-bends), up to the point where the cluster of buildings that include the main temple are just visible. From here its a gentler climb to the temple. It took me about 100m before I got out of my breath and realized how hopelessly out of shape I was. But then, it was not so bad and I could complete the trek in just about 3 hours, which is more or less a standard time. The time was definitely compounded by the backpack I was carrying - it had stuff for the week's trip through the state. I started at 8am from Chopta and reached the temple by 11am. There are quite a few stalls enroute selling stuff from Maggi to biscuits to tetrapacks of lassi and buttermilk. There are also two toilet-tents enroute operated by the Sulabh group: probably the highest in the country(?). Chandrashila lies 1km ahead of Tungnath temple. The trail forks off right at the base of the last flight of stairs that lead up to the Tungnath temple. The trail is not cemented, however, it is clearly marked due to the high number of people trekking up daily. The trek is a steady ascent through switchbacks and takes about an hour to complete. The summit has a small temple and quite a number of cairns. I started the trek at about 4:30am from Tungnath in the intense pre-dawn of the mountains. I had a companion this time - a middle-aged Kolkatan 'Dada' who stayed at the same dhaba as me overnight. I reached the summit by 5:30am to see the entire Himalayan range shrouded in the clouds. The only hope was that the sun, after rising, would disperse the clouds. And so we waited. The revered and mercurial Nanda Devi is due east of Chandrashila marking the horizon; the Chaukhamba massif is to its left and much closer. A sudden gust of cold wind ran over Chandrashila as the sun peeked out over the eastern clouds. The wind picked speed as the eastern clouds refused to part. Nanda Devi lay hidden. And then, after about 10 minutes of the wind, all fell silent. The sun was well above and clear of the horizon. The eastern clouds persisted, but the northern ones had cleared. The Chaukhamba beckoning, along with Kedarnath and Gangotri peaks, all close at hand. It was 6am and almost time for disappointment - no 360 degree view today. And then, almost as a parting gift for a few of us who waited, out popped a rainbow, just to the left of the sun. It was a beautiful sight and I almost wept out of happiness. Only, the tears refused to flow as my body deceided it was more important to run the excess water through the nose in a bid to keep it warm and humid. Well, tears would have been silly anyway. The trek to Tungnath is one of the most easiest of Himalayan treks one can do and is open almost through the entire year. The easy nature of the trek, coupled with the cemented path meant that I felt is safe enough to go solo (I almost never trek solo) and forgo my trek shoes in favour of simple joggers. The trek to Tungnath and back can be completed in under 6hours from Chopta; add a couple more hours for Chandrashila. However, the peculiar weather up top means that the best views are to be had early in the day - from sunrise to about 10am. The clouds roll in around this time and then everything - even Chandrashila - is obscured. 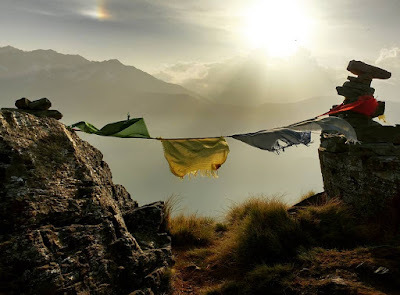 To cover Chandrashila, it is advisable to start from Chopta early in the morning - leave at 2am if you want to cover the sunrise, or by 5am to at least get a decent view. An alternate approach - and especially useful for ones who are not staying near Chopta - is to stay overnight at Tungnath. There are a handful of dhabas near the temple, each offering some degree of puja material, food and accommodation. The temple trust runs its own guest house as well. One can come in early and choose the accommodation according to the budget and availability. The early morning ascent to Chandrashila is quite easy and very rewarding. The trail is snow-covered in the winters, but clear enough for a trek. There are no devotees however, since the temple is closed and the deity is moved to one of the lower villages called Makkumath. Chopta is the road-head for the trek. It lies almost half-way between Ukhimath and Gopeshwar on the route connecting Kedarnath to Badrinath. The route passes through a lush and verdant forest, ascending a steep valley carved by a stream. This is one beautiful road! There are a few buses that ply the route except for the Chardham Yatra season. A few jeeps ply the route as well, though you're most likely to get one if you start early like the locals. The trek to Tungnath and Chandrashila is a very simple trek and yet has some brilliant views. It is an ideal first Himalayan trek for anyone who loves the mountains. So, what are you waiting for?